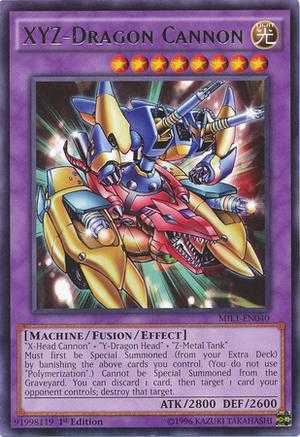 While lacking in terms of attack, this deck offers many forms of card removal through the effects of it's fusion monsters. 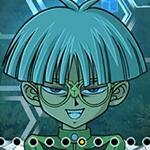 Monsters in this deck can also protect and give additional effects to each other by union equip. 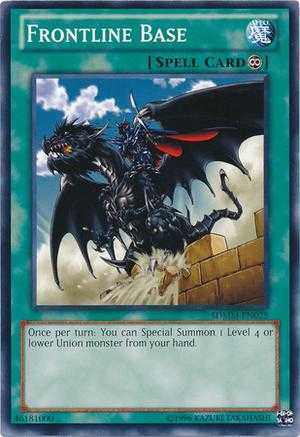 Union monsters in this deck, like Y-Dragon Head and Z-Metal Tank, can easily be special summoned, use cards to help you get them on the field to use as fusion materials. 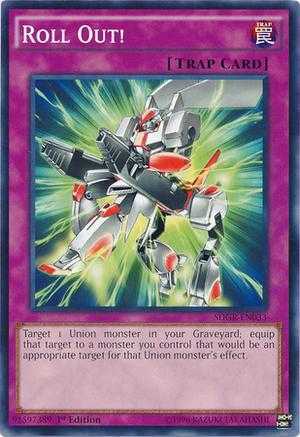 Revive your union from the graveyard with Heavy Mech Support Armor then equip Heavy Mech Support Armor to protect them. Once per turn you can special summon a union monster from your hand with the effect of Frontline Base. 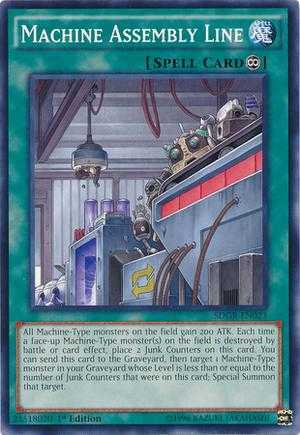 If enough junk counters are present, Machine Assembly Line can also revive a machine-type monsters in your graveyard. 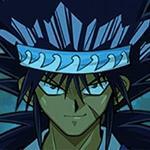 Y-Dragon Head can be equipped to X-Head Cannon to give him additional 400 attack and defense. 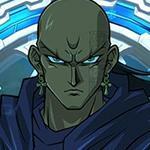 Z-Metal Tank can be equipped to either X-Head Cannon or Y-Dragon Head to have that monster gain 600 attack and defense. Heavy Mech Support Armor can be equipped to any machine-type monster to protect it from being targeted by card effects. 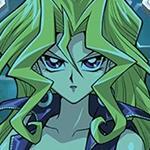 The monsters in this deck don't offer much in terms of attack, even the fusion monsters have comparatively low attack. To make up for this we need to use attack boosting cards. 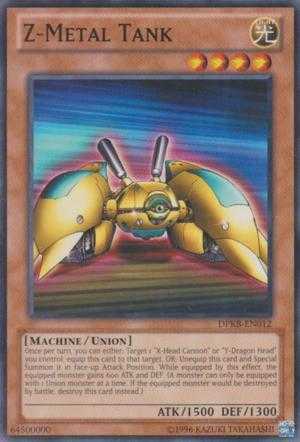 Machine Assembly Line boost all machine-type monsters by 200 attack and can be use as revival for machine-type monsters. 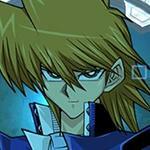 Which is perfect since this deck mostly consists of low leveled machine-types. 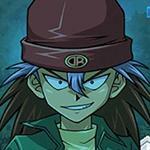 Y-Dragon Head and Z-Metal Tank also boosts the attack of the monster they are equipped to. Contact fusion is this deck's specialty, by removing materials on your side of the field from play you can fusion summon without using polymerization. XY-Dragon Cannon destroys a face-up spell/trap card at the cost of discarding one card. XZ-Tank Cannon destroys a face-down spell/trap card at the cost of discarding one card. 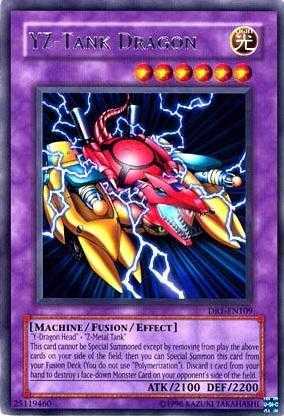 YZ-Tank Dragon tank destroys a face-down monster card at the cost of discarding one card. 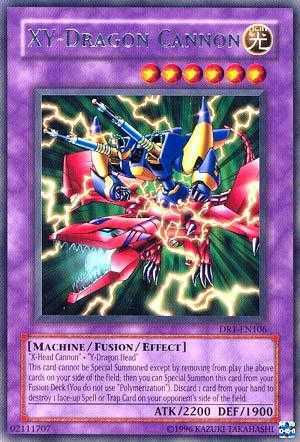 XYZ-Dragon Cannon is your strongest monster and can destroy any card at the cost of discarding one card. Time Machine Revive a monster that was just destroyed. 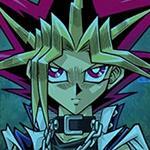 Use to revive the XYZ monsters. Regretful Rebirth Helpful since you're going to remove the materials from play to fusion summon anyway. My current list. I'd play mirror walls instead of super rush and disruption if I had it. Most unsure on heavy mech support armor, might be better with something like powerful rebirth. Have considered trying more x, y, z and only 1 of v and w. Perhaps even with 3 dog tags, but at that point it's probably better with an all in vwxyz fusion deck. OLD recipe FYR. its not great, not a machine theme but offensive instead of stalling. 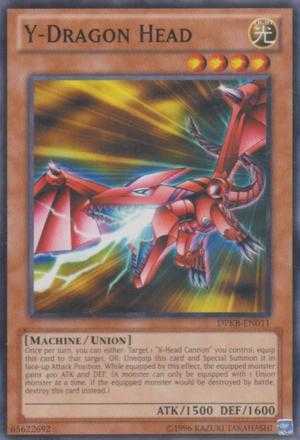 Ultimate XYZ dragon CANNON DECK. 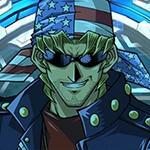 use bandit kieth and use the 7 completed skill for 2 extra 7 completed cards. 2 xz tank cannon and dint forget those 3 man eater bugs. ALWAYS run man eater bug. do this and you will be an xyz expert like me. this deck is outdated since vwxyz farm event. 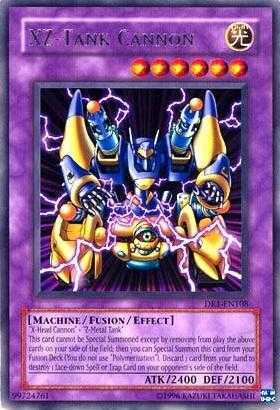 all you need is 2 fusion tag and 1 effect monster; that can special summon another monster when it is targeted by spell card. 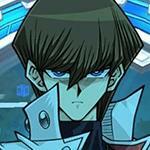 The above decklist needs an update now that we have B-Buster Drake and that Trap card in the Card Trader. Honestly I don't think Peacekeeper is that needed. 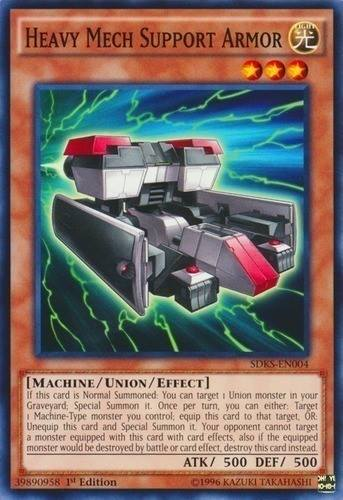 Use Luminois Spark instead of Machine Assembly Line to free up Spell/Trap card space for Union purposes. Man, wish we had ABC instead. Banishing stuff is way better. 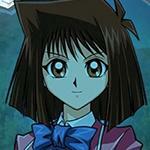 ABC is a copy of XYZ and would be completely broken. It's a poorly balanced archetype and I'm glad this format is still fairly old school. 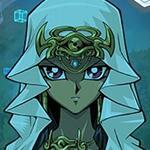 No way dude, then that will cause a new Cyber Angel 2.0 but better. ABC Dragon is too powerful for this format. and its this kind of braindead mentality that konami follows and inevitably hurts its game with.